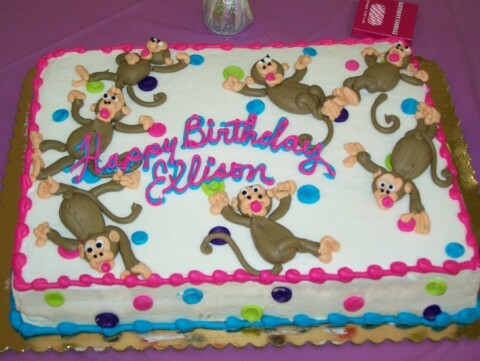 Ellison's 3rd birthday was a "barrel of monkeys!" Her party was at Coach Daddy's school in the gym...it was a big hit. Everyone got to run around, play ball, climb on bleachers, just whatever they wanted to do. Her best friend these days is her monkey "Aah" so, in his honor we had a monkey party. She had a blast, until someone else broke the pinata...but, Daddy stepped in and with a little bit of tape, Ellison got another shot and breaking the monkey herself. (whatever makes her happy...) It was a great day and she was absolutely worn out!! !